Our small table, where we eat when it's just the two of us, has the best view of the bird feeder. 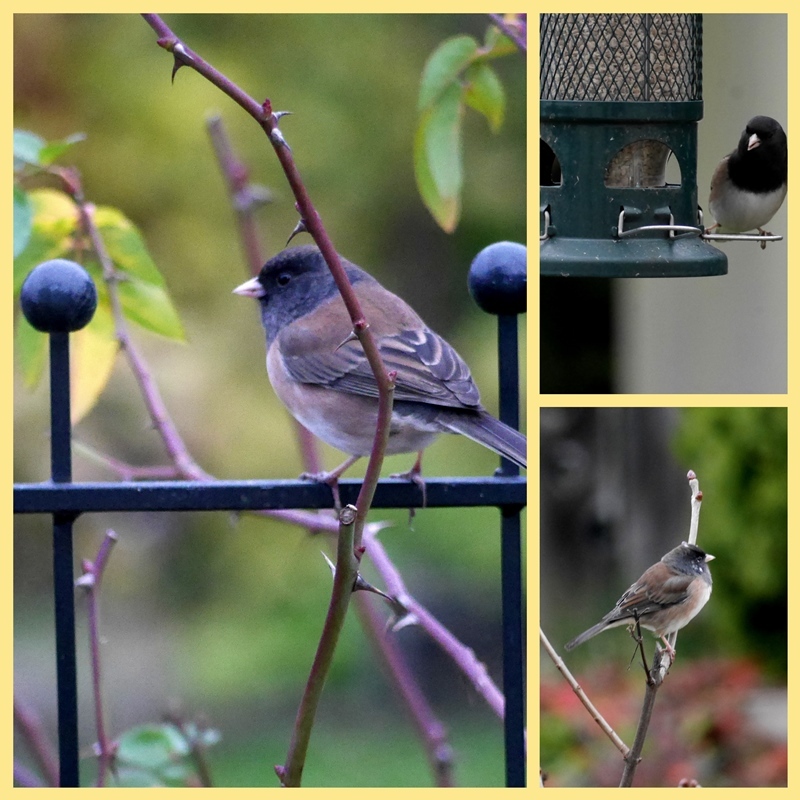 These days we watch black-eyed juncos, house finches, a variety of sparrows, the occasional towhee, and a few chickadees vying for positions on the feeding perches. They can certainly squabble, those birds, all a bit greedy to have sole access to the feeder. Hood's words seem a little harsh for this year's November. We've had a fair bit of sunshine and just yesterday I saw a wasp inspecting a red Christmas light strung along the eaves, perhaps thinking it some sort of flower. I pulled on my wellies this afternoon and tramped around the garden. How surprised I was to see a few flowers: a couple of cornflowers, a sweet pea, some roses, a stalwart zinnia, and of course, the reliable hydrangeas that are hanging on very well this year. So take that, Thomas Hood! There were even a few raspberries! A wind warning has been issued for tonight and tomorrow - wind and rain are set to batter the garden and curl around the corners of the house. We're warm and cozy indoors. The lighted picture is a recent acquisition, and difficult to photograph properly. Since we get so little snow, this snowy scene with the twinkling lights in the trees and the lamps glowing is as close as we get to a walk in a white landscape. Although our fires are gas, the flames are still most welcome when I stand and warm my back, then my front, toasting both sides, as it were. Around the kitchen windows I've strung star-shaped lights for a soft glow that makes me smile to see them. There's a party on Friday, with Tim's work colleagues, so I've done a little baking - cranberry orange shortbread, pecan toffee squares, almond cream cheese bars, and raspberry diamonds. We sampled them this evening and they pass muster. November days are passing. Today marks just one month until Christmas. This coming week is a busy one with a school inspection (I teach at an independent school and we are inspected every 4 years), and three evening events, including a party on Friday night. December's calendar is curiously empty, save for a couple of dates. I don't mind. A slower pace allows for time for reflection and thinking about the focus of the season, of the birth of Christ, as well as time for preparing the house and all that goes with celebrating. How is your November coming along? Are you full into the Christmas mode, or do you have some time to think and reflect, as well? Yes, Thomas Hood is so wrong for we have had also stunning sunny days! For today it is promised a bit of snow. Your lighted snow fall picture on the mantlepiece is adorable and so are your bird photos. I have been looking through the window blackbirds but they are too far for me to photograph. Wishing you a great new week and a peaceful mood in the middle of all busyness of life. Yes, here we are starting the last week of November. I agree, Thomas Hood is a bit harsh. Our November has been delightful with crisp cool days. And yes, we too enjoy our gas logs. It makes it easy to have a cozy fire on demand. I'm moving into Christmas mode. The tree is up and decorated, and tomorrow I will change out the mantel decor for Christmas / winter. Then I'll pull out my Santa figures, the Christmas pillows, etc. It's on to a new holiday! Lovely to see all your different birds. Our feeder is getting very busy since the colder weather. No Christmas thoughts far for me so far, but I am having it easy as we shall be staying with youngest son and his family. I am dreaming of escaping the pre Christmas hustle and bustle especially with this glorious late autumn sunshine streaming through my windows - fingers crossed the snow stays away. Your baking looks so good and is a beautiful feast for the eyes. Beautiful, evocative, delicious photos, Lorrie! I could have agreed with Hood when I was younger, but nowadays November seems wonderfully peaceful, soothing and beautiful, at least here in the countryside. Perhaps in the towns the feeling is different. We decorate for Christmas only in the very last days before Christmas, but we are making plans, cleaning etc. now. I thought that I would be full into Christmas mode, but instead am taking my time, which may or may not be a good thing. I love your descriptions. I am smiling as I imagine you turning to warm yourself by the fire. I would think that your December calendar is going to fill up quite a bit more. They always seem to... Oh Thomas seems to have perfectly described New England these days. I am blessing God for the neighbors who have put up lights. Such cheer on cold, dark days. I have had a busy month, preparing for Christmas. Now I can sit back and enjoy the hard work and look forward to spending quality time with family. Hello, November is going by quickly. Christmas will be here before we know. Your post and photos are lovely. I love the cute bird mosaic and your mantle looks pretty. The sweets look delicious. Have a happy day and a great new week ahead! ...a yummy collection for the eyes and tummy! November has just flown past for me. Lorrie. I love that you have lights in your windows that make you smile when you see them. Your mantle is lovely and I, too, warm myself in front of a gas fireplace. I love a slow pace, I find as I get older I want to socialize less, I just want to be home. Your end of November looks beautiful. Yesterday we picked up most of the fall décor. We put our tree up on Thanksgiving. Today I will start decorating the rest of the house. I'm usually full on Christmas by now, but I've only put up some of the garlands and lights, and no tree! That will wait until next week, when I'm back from my trip to Texas! Enjoy your busy week, then onto a quieter Christmas! Your home is so cozy and warm looking and would be so even if that snowy scene were real. The RV we traveled/lived in had a gas fireplace and we miss that now ... this one month of the year (these days) when we experience chilly damp mornings. (We loved it then because the home we sold after retirement had two wood-burning ones that were definitely not missed). .. The hydrangeas on the mantel in front of the painting are wonderful. Did you dry them? They are a favorite flower because they look lovely in all their stages. I can't believe that November is so nearly over. Your little bits of colour are so pretty, there are usually some tiny things to be found in the garden. I even had a rosebud today! Lorrie - those raspberries are so plump and full of color - for November! We are blessed with a real fireplace, and sitting near it to watch the never-ending dance of flames is one of my favorite things to do in winter. We will be making Christmas cake later this week, and it will add to my already growing Christmas spirit. This week is calm in terms of activities outside of the house, but the pace will pick up as December commences. So, we have set aside this week for baking and decorating. I am loving it! Thanks for adding such lovely shots to Mosaic Monday! Loved the lighted picture. I'm in full Christmas mode now! Lovely images! I am definitely not in Christmas mode. I'm let down by Thanksgiving being over. Dear Lorrie - To watch various birds flitting and resting must be comforting. The lighted picture is beautifully decorated with the dried hydrangeas. Your bakings are mouthwatering. November has fleeted here while I was busy at the school art events as well as my family’s and autumn foliage viewing in relatively warm and sunny weather. Your images are so beautiful, especially your bird mosaic. Thomas Hood must have spent some time in my neck of the woods. He describes it perfectly and accurately. However, we did get a little snow and more is promised. We will not see even a blade of green grass until Spring. Lorrie, Had my last craft sale on Saturday with dismal sales. The church was decorated on Sunday which usually happens on the first Sunday of Advent so I was surprised. I checked though and that is the Dec 1st. I will dig out my Ann Voskamp book The Greatest Gift and read through it in December. The baking looks delicious. Have a great week. Sylvia D.
We are in full on Christmas mode here too. Since I was having a guest today, I felt the pull to get the house ready for Christmas. Although I may tweak it, I am happy to have a festive house to enjoy for a month or a little more. Your plate of treats is so pretty, and I'll bet it is yummy too! I am amazed at your November raspberries! I'd have a hard time pulling myself away from that cozy fire! We plan to put our decorations up during December, although many houses have already got twinkling lights and trees showing. On a foodie note - those raspberries look delicious. I do believe you have more than we do in the garden. Raspberries! Wow! That is amazing. Your cookies look so good. I haven't started any baking, but soon I must as I have alot of events in December. I love, love that snowy picture with the lights. How beautiful! The poems also are so fitting and wonderful in the post. What a pleasant surprise...finding raspberries in November! I wish I could reach out and sample your Christmas goodies. They look so yummy! I need to get started on my Christmas baking.